Doctor Ashley Olson, a native of Seattle, earned her undergraduate degree in business from the University of San Diego where she also played four years of Division I soccer. Prior to attending dental school, Dr. Olson worked as a sales consultant for the craniofacial division of the medical device company, Stryker. It was this exposure to oral and facial surgeries that inspired Dr. Olson to pursue a career in dentistry. She went on to graduate from the USC School of Dentistry, receiving dean’s list honors and faculty nominated awards for her excellence in clinical dentistry and for her leadership and service to the community. 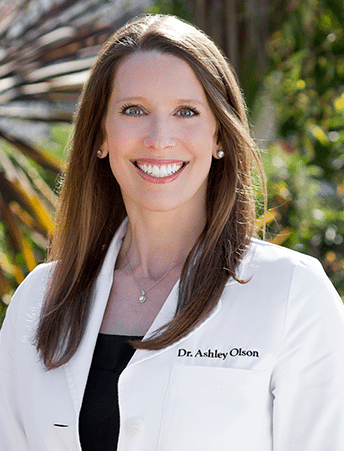 Dr. Olson is an active member of several dental organizations including the California Dental Association, American Dental Association, San Diego Dental Society, and American Association of Cosmetic Dentistry. Dr. Olson enjoys the artistic and clinical aspects of creating beautiful smiles, and through her gentle approach, she is committed to making each patient’s visit to our office both comfortable and enjoyable.